As a kid, people were always trying to get me to listen to the symphonies of Ludwig van Beethoven. The adults decided they were good. I wasn’t buying it. To my kid ears, there was just too much happening in them. I had no context to understand them. They seemed long and pompous and had no real way to get where they were coming from or why they existed. Not for me. Not yet. I just listened again to the entire cycle, one through nine. It takes about six and a half hours. I felt transported, each symphony different from the last and also more innovative. I was delighted at every movement of every symphony. You gain a sense of Beethoven’s intrinsic voice and also how he matured through time and kept pushing out the paradigm to encompass ever more voices, moods, and moments. Taken as a whole, it is the story of a life in art. I reveled in the charm, the drama, the creativity. There was something in them that I heard for the first time: the celebration of human life and its achievements – a world built by human hands to delight the human heart. If I were to name one theme, it would be this one. It’s a departure from what you would have heard from 100 years earlier, to say nothing of 300 years earlier. There is a signature to these symphonies, and it is made by human hands to celebrate life here and now, the glory of the world around us – not in some outer beyond, not in some imagined utopia, but right around us, tactically present. 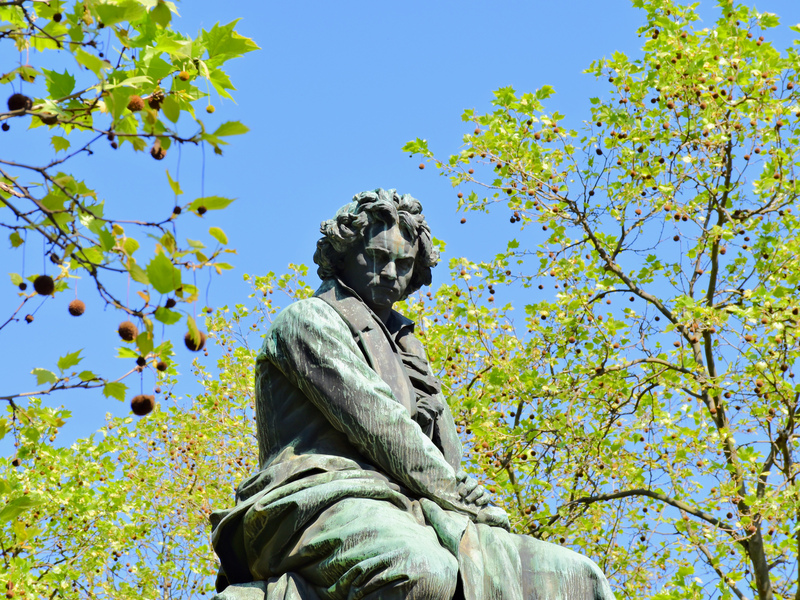 Beethoven composed the theme music for the world around him. Beethoven’s music incarnates the high ideals you find in Renaissance and Baroque music by taking those ideals in a new direction, toward the celebration of human life as a path to transcendence. A German composer of the 16th century specialized in turning the mind’s focus away from the world toward the face of God; Beethoven pointed to the forward motion of history itself as evidence that we are surrounded by God’s blessings. Why was he able to do this? Music is not mere abstraction; it emerges from and is understood within the firmament of history and culture, what we see and what we experience. Beethoven composed the theme music for the world around him. Everywhere he looked, it must have seemed like the birth of something gloriously new. Beethoven’s symphonies appeared in succession from 1800 to 1824 (he died in 1827). That’s a pretty short span of time but also the period in which one could observe that the old world was passing and giving way to the birth of modernity more or less the way we know it today. Beethoven was born into the Industrial Revolution. It was at this time that began what Dierdre McCloskey calls the Great Enrichment. The experience of life on earth dramatically shifted. Lives became longer, the existence of the middle class spread further and further, violence declined, wars were going away, communication became better, and commerce and the merchant class took control of the direction of history to give humanity more disposable income, better opportunities, new technologies, and a new period of peace. And what was being washed away? The old world of hierarchy, frozen social position, disease, and violence as a means of getting what you want was melting. The cowering, the deference, the sense of being born into your life status – it was no more. What you saw around you was a world of opportunity. You could be bold. You could dream. You could live a life of your own making. Beethoven was born into the Industrial Revolution and therefore inherited a world very different from Haydn (his teacher) or Mozart, to say nothing of Bach. As with everyone in history, most of his would-be siblings died in childbirth; of seven children to his parents, only he and two brothers survived infancy. By the time he was coming of age in the 1780s, infant mortality was already falling, diseases were being cured, production was expanding, population mobility was increasing, and rising freedom led to creativity and new products the world had never seen. Consider the inventions the world saw during the period in which these symphonies were first heard: the battery, the steam locomotive, the typewriter, cement, photography, the microphone, and the earliest electric light. And just around the corner of time were the telegraph, the revolver, the sewing machine, anesthesia, to be followed by internal combustion, steel, cities lit by electricity, and flight. The symphony becomes a microcosmic social order in all its diversity, layers of activity, and surprises. This new world was dawning as Beethoven was writing these symphonies. He didn’t intend to write the soundtrack, but his wild creative genius captures the spirit of the times as well as any music one can imagine. And he was an enthusiastic participant in the commercial life of music in Vienna, charging as much as the market would bear for tickets to hear his symphonies, developing solid connections with commercial publishers, and even remixing his own compositions once they became popular in order to find new markets (and rush to market before others could do so). There is so much to say about each of the symphonies. Consider just the first chord of the first symphony: it is dissonant and immediately wants resolution. The first two chords of this first movement sound like the ending of something composed in the last generation. The daring wit here alone is completely delightful, and we’ve barely begun. Previous generations had regarded the symphony as scaled up chamber music — more instruments opening up new possibilities for combinations of sounds. Beethoven reveals a different conception: the symphony becomes a microcosmic social order in all its diversity, layers of activity, and surprises. It had a mixed reception in 1804, some regarding it as innovative and others dismissing it as affecting originality and modernity but failing to convince. And perhaps that is why the 4th strikes me as more conservative in approach, but his caution didn’t last long. It is fitting that his 9th symphony would come to emerge as humanity’s universal song of liberation. The 5th symphony is the most famous symphony in human history for a reason: it is still brilliant, every bit of it, from its signature opening to its soaring and wildly triumphant ending (which sounds fresh each time you hear it, even after 1,000 listenings). The luxurious 6th symphony strikes me as a celebration of the great gift of bourgeois capitalism: leisure. The time to reflect. The opportunity to enjoy. The freedom to appreciate and even create beauty. Let me draw special attention to the vigor and aspirational quality of the opening movement of the 7th symphony. It has this remarkable upward motion rendered in both notes and rhythm. It’s 14 minutes of sheer optimistic bliss. You can just feel progress on the march. It is truly fitting that his unspeakably inspiring 9th symphony would come to emerge as humanity’s universal song of liberation. I will forever associate this piece with the fall of the Berlin Wall, with Leonard Bernstein’s remarkable performance in those days. His tragedy was turned to glory, if not for himself then for the world that he ushered in through his genius. Now consider this: Ludwig was already losing his hearing by the time he composed his first symphony (his condition would have been easy to cure in our times). He was completely deaf by the time he composed his last. His suffering must have been acute. We know from letters that he considered suicide. He experienced several serious bouts of illness. His romantic life was only a frustration. His lack of aristocratic heritage (“van” is not “von”) stymied many of his ambitions. His life seems to have been nothing but pain, filled with disappointment, disease, and death. And yet, look what he achieved: he learned to hear music in his heart, more elaborate and extraordinary music than any human had yet heard in the physical world, and then give it to humanity. His tragedy was turned to glory, if not for himself then for the world that he ushered in through his genius. It is almost a literal fact that there is no trace of cheapness in the whole body of his music. He is never sweet and romantic; he never sheds conventional tears; he never strikes orthodox attitudes. In his lightest moods there is the immense and inescapable dignity of ancient prophets…. Beethoven disdained all their artifices: he didn’t need them. It would be hard to think of a composer, even of the fourth rate, who worked with thematic material of less intrinsic merit. He borrowed tunes wherever he found them; he made them up out of snatches of country jigs; when he lacked one altogether he contented himself with a simple phrase, a few banal notes. All such things he viewed simply as raw materials; his interest was concentrated upon their use. To that use of them he brought the appalling powers of his unrivalled genius. His ingenuity began where that of other men left off. His most complicated structures retained the overwhelming clarity of the Parthenon. And into them he got a kind of feeling that even the Greeks could not match; he was preeminently a modern man, with all trace of the barbarian vanished. Into his gorgeous music there went all of the high skepticism that was of the essence of the Eighteenth Century, but into it there also went a new enthusiasm, the new determination to challenge and beat the gods, that dawned with the Nineteenth.